A person should just move on already, shouldn’t they? This is an established and accepted creed.Yet to ancient Roman philosopher Marcus Cicero counter thoughts have been attributed: “To be ignorant of what occurred before you is to always remain a child.” Sounds harsh- let us rattle that one around for a while. 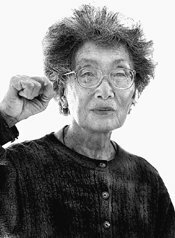 Her name was Yuri Kochiyama (Mary Yuriko Nakahara). She was a bright, young Japanese-American woman fresh out of college. In the early ’40’s, she was the only Asian working at her department store. Soon enough, however, she would find herself around other Japanese-Americans during World War II. On February 19, ‘42, President Franklin D. Roosevelt declared Executive Order 9066, which sanction Japanese-American citizens to “detention centers.” If an American was Japanese at that time, things became dark quickly. Yuri and her family, along with over 100,000 other Japanese-American people, were sent to “detention centers.” These detention centers were formed on fairgrounds, racetracks and stables. Those sanctioned would only arrive with as many goods as they could carry. Under such bleak and horrifying circumstances, Yuri’s positive attitude seemed unwarranted. She imagined that this is how Japanese people could show their loyalty and love for America; by just obeying. She was imprisoned for over two years. But even among the filthiest and unkempt garden, the most beautiful flower will sometimes bloom; within the confines of her dismal home, she met her future husband, Bill Kochiyama. After their release, Bill and Yuri married and moved to Harlem, NY. It was there that she became a human rights warrior. Sensitive to the revolutionary struggles of the twentieth century, she focused on the oppression of darker-skinned people. She was once arrested protesting for jobs for African-American and Puerto Rican construction workers. She met Malcolm-X in ’63 and they became unlikely friends and collaborators. Malcolm wrote her letters from his expeditions in Africa with African supernumeraries. She was gifted at bridging the gap between Asians and blacks; connecting a common oppression, a harmonious battle cry. In ’65, while Yuri was attending one of Malcolm’s orations at the Audubon Ballroom in Manhattan, NY Malcolm was assassinated. In distress, she held her hero’s head in her lap. He was a mere 39-years-old. The murder of Malcolm-X crystallized this quiet, humble and tiny Asian woman’s resolve for human rights, racial equality and social justice. She was a voracious study, exploring the path of martyrs, servant leadership and reparations. In ’88, almost 50 years after President Franklin D. Roosevelt’s Executive Order 9066 was declared, President Ronald Reagan signed into law the Civil Liberties Act, granting reparations to Japanese-Americans who had been imprisoned during World War II. The repayment, which is still ongoing, includes but is not limited to $20,000 for survivors. It was concluded that the detainment of these Americans resulted more from a manifestation of racism, not military or security matters. The government announced that such behavior was founded on “race prejudice,” “war hysteria” and a “failure of political leadership.” Sadly, Japanese non-citizens who were taken from their homes and imprisoned during those dark times are not included in the reparations. One is left to wonder… What if Mrs. Kochiyama had just sat on her hands like a “good, obedient Asian”- as she did all those years ago in the detention center? What if she hadn’t complained, had merely forgot about the past, focused on moving on, didn’t hold open houses, didn’t tape newspaper clippings to the walls and didn’t keep stacks of pamphlets on the kitchen table and didn’t push for reparations—would the pain and suffering of Japanese-Americans have been recognized or exonerated? Not likely. Does a closed mouth get fed? Not usually. Do squeaky wheels get the grease? Yes, sometimes they do. Thank you, Yuri Kochiyanna for your contribution to raising the consciousness of humanity. Sometimes we do, indeed, need to live in the past in order to bring balance to the present.